I have seen the terms Machine Learning, Data Science, and Data Analytics used interchangeably. Even though these three concepts are related and could even be considered to be part of the same field, there exist important differences that need to be discussed. 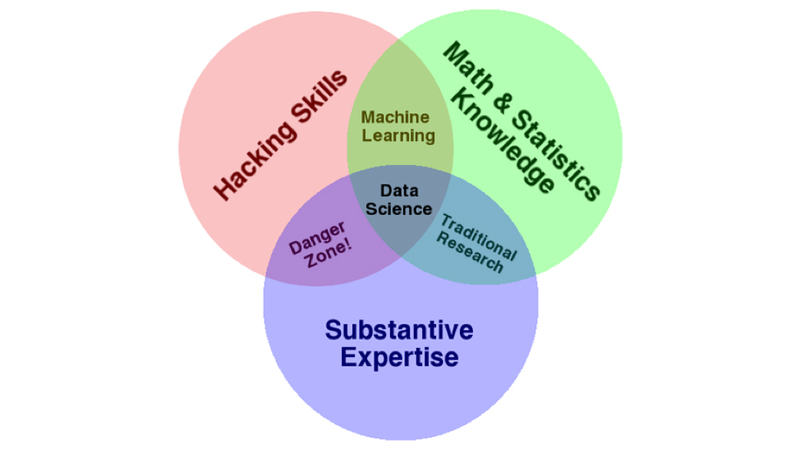 There is a well-known Venn diagram that showcases how machine learning and data science are connected (included below). In short, data science is a broad area whereas machine learning is more specific. When we are talking about data science, we are referring to the whole process from gathering raw data to getting a result. This includes gathering data, handling big data, cleaning the data, analyzing the data, and finally reaching a result. We can also see machine learning in the Venn diagram. It is shown as requiring hacking skills as well as math and statistics skills but not necessarily needing substantive expertise. This is a bit misleading. Machine learning deals specifically with analyzing the data. This means that machine learning is only a small subset of the big concept that is data science. That said, machine learning specialists need immense knowledge not only to determine which algorithms to use for a specific situation, but also to create their own versions that specifically satisfies their needs. When the Venn diagram specifies that machine learning does not require substantive expertise, it is referring to simply using it. Anyone can go online and find a tutorial on how to use a neural network to predict an output for a given dataset. But when talking about how and why this works as well as small optimizations, there is a lot of needed expertise. Data analytics is more on the realm of statistics. It is not unusual to see a data analyst and a data scientist working alongside each other. That being said, a data analyst should be able to take data and interpret it. They are responsible of graphing the data and explaining what is going on. As Srihari Sasikumar explains in his simplilearn article Data Science vs. Data Analytics vs. Machine Learning (https://www.simplilearn.com/data-science-vs-data-analytics-vs-machine-learning-article), “A data scientist creates questions while a data analyst finds answers to the existing set of questions” . Data science is the broadest term out of the three discussed in this article. A data scientist can work as a data analyst and as a machine learning specialist; however, this is unusual. Usually, data scientist work on teams where there are specialists for every area of the process. Looking back at the definitions, a simple summary is: Data science is the complete process of collecting, handling, analyzing, and interpreting data where analyzing is done by machine learning and interpreting is done by data analysis.